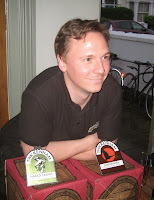 A few bits of news gathered at and around the KGH event included that Twickenham Fine Ales brewer Stuart Medcalf (left) has revived the original recipe for Sundancer golden bitter. As a result it's back to the crisp, aromatic and lightly astringent beer that won a silver medal at the 2007 GBBF. Excellent! Twickenham is also now brewing a 'house beer' for Kew Gardens – this is on sale in the shops there and I'll try to get a bottle soon. Also in bottle now are the soured beers that Twickenham's former brewmaster Tom Madeiros (now at Quercus in Devon, incidentally) brewed in collaboration with Belgium's Alvinne and De Struise breweries. These have been ageing in barrels for two years and have been bottled both straight and as a blend to smooth out the sourness and add depth. With all its specials and six seasonal ales a year, Sharp's is now brewing a lot more than just Doom Bar, which has reportedly become the UK's no.1 cask ale. Formerly 95% of Sharp's volume, Doom Bar is now 85% - but of course overall production is up over 50% too, so that's still a lot more Doom Bar. The next best sellers for the brewers from Rock are Cornish Coaster, Sharp's Own and Sharp's Special. Oh, and there's a new American Pale Ale called Sharp's Atlantic due out in a couple of months. While talking to David of Kew Brewery about his search for a brewkit, he mentioned that M&B has indeed sold the Botanist brewery, although not to him. Coming past the Botanist later on, I saw that the brewkit has now gone.